I am loving this card. Art's a little weird, but the card might just have aggro and combo applications! Can't wait to start tinkering with this guy. I'm really wondering if I wanna run this guy in my deck. I run Flames of Keld so it's very possible to cast three spells a few turns in a row. I can definitely tell I won't like this as much as Earthshaker Khenra but it may still fill the spot of a 2-drop. Especially since I can turn two this and turn 3 for either a one drop and another two drop to have this be a 3/3 turn three or even Chainwhirler because even at just 2/2 that's something and gets it building for turn 4. Trying to decide if this is good to combo with Grinning Ignus in Animar, But it's late and my brain is half asleep. I think it works as another way to make infinite colourless mana and infinite counters on Animar, right? Runaway + Ignus + RR = infinite storm, though not infinite colorless mana. I think. 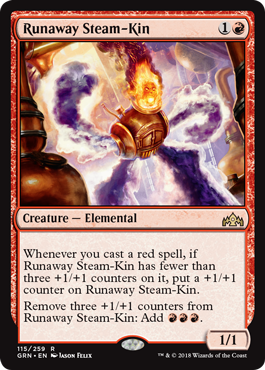 Steam-Kin + Ignus = infinite recasting of the Ignus for a net gain/loss of 0 mana. With Animar reducing the cost you get a net gain of mana. Also a very big Animar.